An H-bridge chip such as the L293/SN754410 can control up to 2 motors. So in order to control 4 motors, we will need to use 2 H-bridge chips and tie them together. We will build a circuit where all the motors are synchronized, meaning they act in symphony. Thus, if we input so that forward motion is activated, all the motors will spin in a forward direction. 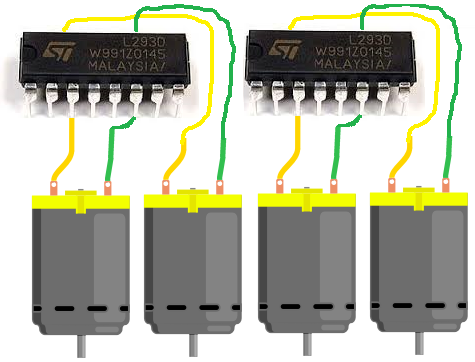 If we input reverse mode, all the motors will spin in reverse direction. So the motors act in concert. This type of circuit is useful for any circuit that needs multiple motors. A common electronic device that now uses 4 DC motors are flying drones. If you go into amazon or any various online retailers to get a toy drone, the majority of them use 4 motors, the 4 of which act in concert. So this type of circuit has very valuable use in the real world. In actuality, you could use how many motors you want. Since each H-bridge chip can operate 2 motors, then if you wanted to have 8 motors running, then you would need 4 H-bridge chips. If you want 16 motors running, then we need 8 H-bridge chips. You would just have to know how to connect them together, which is relatively simple. It's like just cascading them in a sequence. But in this circuit, we do 4 motors. These are all the pins of the motor. Once power is supplied to the IC and the motor and all the terminals of the motor are connected, then the pins which determine how the motors will operate are the logic levels that we feed into it. When the enable pin is high and the motor is fed a LOW voltage signal at the first pushbutton and a HIGH voltage signal at the second pushbutton, then the motors will spin forward. When the enable is high and the motor is fed a HIGH voltage signal at the first pushbutton and a LOW voltage signal at the second pushbutton, then the motors will spin in reverse. And with both logic levels at the same level (2 HIGHs or 2 LOWs), then the motors will stop spinning. The H bridge circuit we will build to control 4 motors is shown below. How this circuit works is based on the 2 switches that control the logic state and the 1 enable switch. All the motor logic pins are tied together for each of the motors, so the 2 pushbuttons control the logic state for all the 4 motors. Thus, this is why they act in concert. 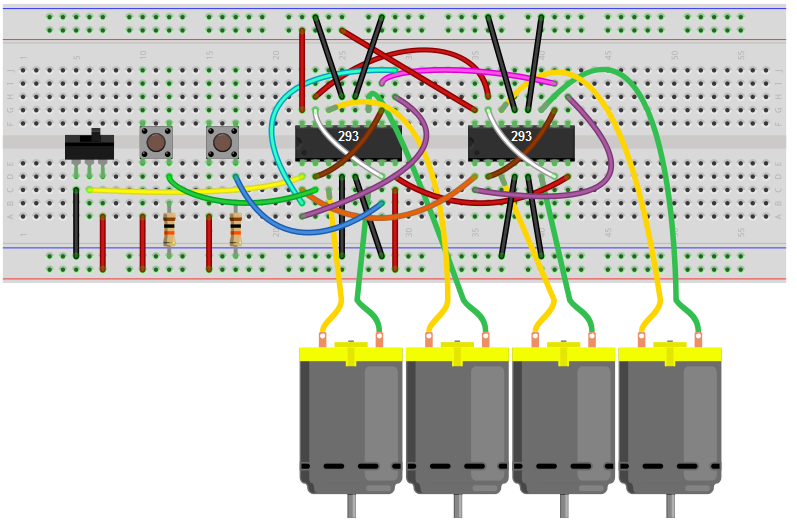 So the first pushbutton controls the first logic state for each of the motors. 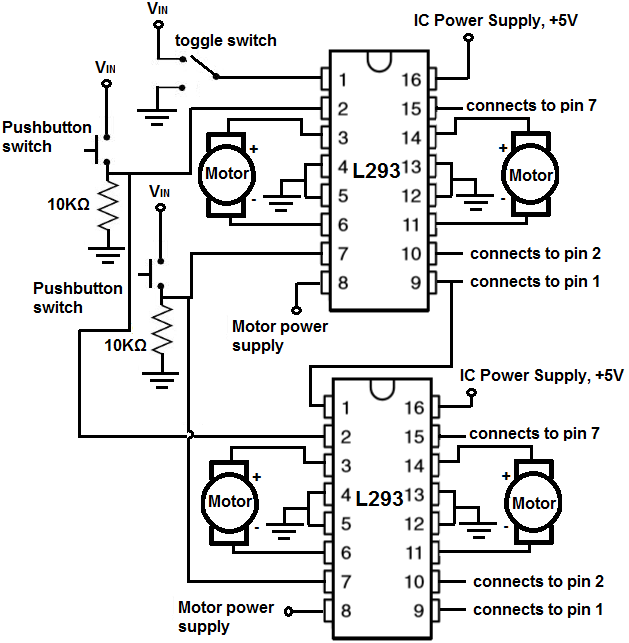 And the second pushbutton controls the second logic state of each of the motors. So with the motor logic pins normally LOW, if we press down on the second button while leaving the first one unpressed, then the motors will spin in a forward. Now if we press down on the first pushbutton while leaving the second one unpressed, the motors will spin in the reverse direction. If we leave both unpressed or press down on both simultaneously, the motors will not spin. And this is all that is necessary for the operation of our 4-motor device. To wire it up, it's pretty simple. For each chip, we connect terminals 1 and 3 and then connect terminals 2 and 4. This way, both motors of a chip are synched in together in a given chip. After this, for each additional chip we do the same, and then tie in the the logic pins of the chip before into the chip after, so that all logic pins are connected together.